Till you know what you want. Joni and Joe are both correct but there's another aspect: You can't tell what you want until you know what's available. Some people try but they're cheating themselves. This is often when they're looking for the cheapest price today. In the prior post, we looked at why you can't (and don't) buy on price. You can't decide without knowing your options. Let's look at a concrete example: buying a computer. Here's a page from a old Best Buy flyer. Click on it to enlarge and take a look. 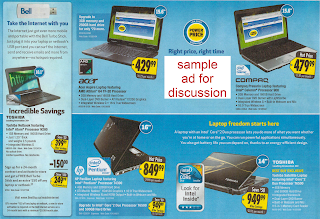 Using only this ad, which computer would you pick? As you look at the ads, notice what's generally missing: weight, battery life, thickness and screen resolution. What you think you want, may not be what you buy or what satisfies you. That's what happened when I bought one of those new-fangled all-the-rage netbooks. I thought netbooks were interchangeable and bought primarily on price (not from Best Buy). I got an HP Mini 110 for $50 off. The price was fair, but I quickly found that what I got wasn't what I wanted. I got annoyed by the bilingual keyboard (a pet peeve), trackpad buttons on the sides instead of the bottom, the lack of Bluetooth, the weak wireless antenna, and the poor resolution anti-glare screen (1024x576). Here's the big surprise with the Dell Mini 10: complete silence. Portable computers are generally quiet but the spinning hard disk and cooling fan make some noise. I paid an extra $130 for a 32 GB solid state hard disk (SSD) made from memory chips instead of the usual spinning 160 GB magnetic hard disks. Frigid winters, humid summers and foreign travel are tough on delicate mechanical devices. Even if nothing goes wrong, there's the worry that something could. What do you do then? The multi-touch trackpad is a "free prize" that did not affect my purchasing decision but is very satisfying to use. The point here is not to keep spending more because your needs are probably different. The lesson is that I didn't realize how much I valued silence before. There's no way I would have bought the Mini 10 at the outset because I didn't know what I wanted or how much I'd pay for it. You've probably had similar experiences. We don't know what we want until we know what is available. We can't know.